Wednesday September 4th 1895 Will broguht Laura home this morning. I was busy with the work all forenoon and sewed some after dinner. Charlie Byington came out to stay all night. Thursday September 5th 1895 Laura packed her trunk this monring and Will took us down in the Surry. We left her at the depot but did not wait for the train. I put in the afternoon sweeping and cleaning. Friday September 6th 1895 Will churned for me this morning. I was busy all morning we went to town after dinner. I walked on over home. Mrs Chalfant & Mrs [Currant?] were there. home to do evening work. Saturday September 7th 1895 I was at home at work all day. I put up peaches and tomatoes. Oliver helped me wash a few things and I ironed them. Will took the horses to the valley in the morning and went to town in the afternoon. a beautiful day. 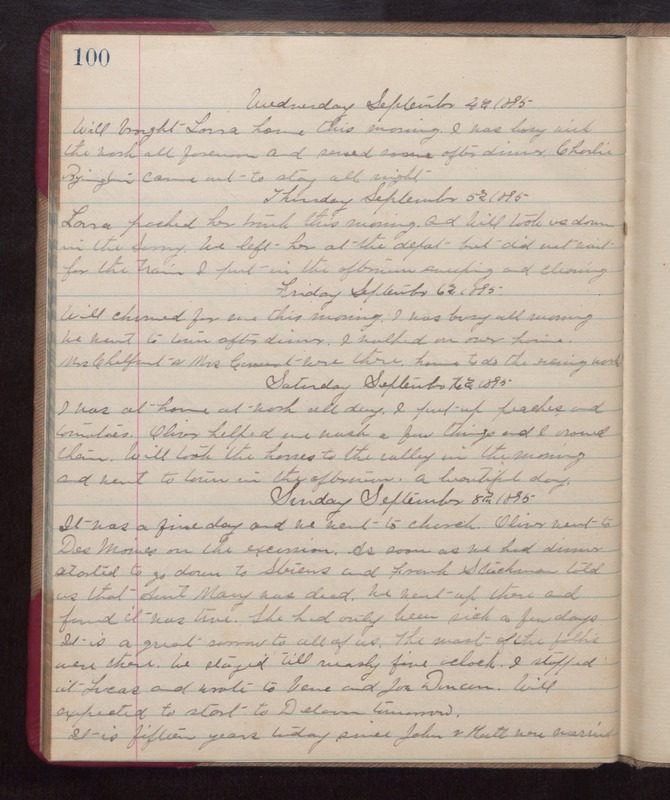 Sunday September 8th 1895 It was a fine day and we went to church. Oliver went to Des Moines on the excursion. As soon as we had dinner started to do down to Stevens and Frank Stackman told us that Aunt Mary was dead. We went up there and found it was true. She had only been sick a few days. It is a great sorrow to all of us. The most of the folks were there. We stayed till nearly five oclock. I stopped at Lucas and wrote to Vene and Joe Duncan. Will expected to star to Delevan tomorrow. It is fifteen years since John and Hattie was married.